The Village of Lewisburg is working to raise money for the upcoming Bicentennial Celebration. The main way the committee raises these funds is by selling merchandise from their Bicentennial Storefront. Not only can one find many different items for sale, but there are also historical items and documents on display. LEWISBURG — The Village of Lewisburg is working to raise money for its upcoming Bicentennial Celebration. The village began celebrating the 200th birthday in January with a kick-off party. Since then they have held monthly celebrations, such as the event which included an Abraham Lincoln impersonator in February. Another way they have celebrated the momentous year is the opening of the Lewisburg Bicentennial Store in 2017. The store is located at 123 N. Commerce Street and carries a plethora of village merchandise. 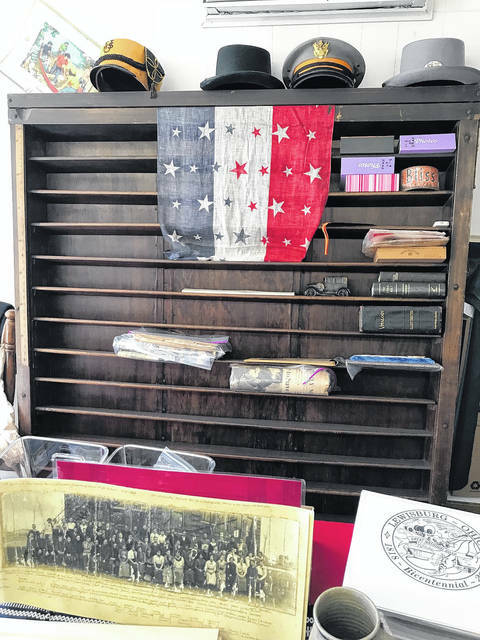 The store also has several items on display which are not for sale, such as sesquicentennial history books and historical items from different community members. While the store does not have set hours of operation, hours are posted on the Lewisburg Bicentennial Celebration 1818-2018 Facebook page. In fact, the Facebook page itself has become an outlet for community members to share their own stories and photographs of the village through the years. According to the Bicentennial Committee, the store is fully staffed by volunteers. While they do try to be open two hours on Tuesdays and Thursdays between 4-8 p.m. and on Fridays from noon to 2 p.m., those hours are not always guaranteed and are verified on the Facebook page. Still, a trip to the store is well worth the effort. Not only do visitors have an opportunity to look at antiques and vintage documents, but they can also support the celebration by purchasing one of the many items for sale. The village sell t-shirts in many different styles and colors, but they also have more interesting finds as well. At the Bicentennial Store, one can purchase: Bicentennial History Booklet, 2018 Lewisburg Monopoly Game, an afghan, stock certificate, flag, wooden nickel, gold coin, 2018 Cookbook from Past to Present, Sesquicentennial 1993 Cookbook, commemorative room spray, High School wooden block, Middle School wooden block, Depot wooden block, lapel pins, Karl Horn “The Attic” book, Karl Horn “The Attic Supplement” book, tumbler, mug, tea cup, umbrella, and street sign. More information can be found on these items at lewisburg.webs.com/fundraisers-merchandise or on the previously mentioned Facebook page. The committee is constantly adding additional items. https://www.registerherald.com/wp-content/uploads/sites/41/2018/03/web1_LewBicen.jpgThe Village of Lewisburg is working to raise money for the upcoming Bicentennial Celebration. The main way the committee raises these funds is by selling merchandise from their Bicentennial Storefront. Not only can one find many different items for sale, but there are also historical items and documents on display.